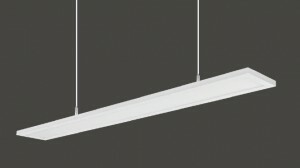 Pure white diffuser for soft light distribution. LED are positioned on the side and on the top part with different PCB. Each PCB can be connected with separate driverto have different distribution effect between bottom and top part. Laserprinted PMMAlightguideand 95% reflective film.